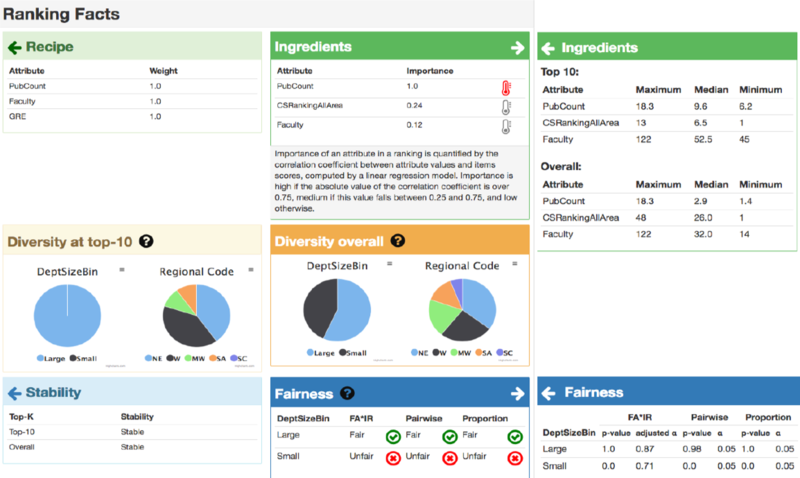 A Web-based application that generates a “nutritional label” for rankings. Ranking Facts is made up of a collection of visual widgets that implement our latest research results on fairness, stability, and transparency for rankings, and that communicate details of the ranking methodology, or of the output, to the end user. DataSynthesizer consists of three high-level modules - DataDescriber, DataGenerator and ModelInspector. The first, DataDescriber, investigates the data types, correlations and distributions of the attributes in the private dataset, and produces a data summary, adding noise to the distributions to preserve privacy. DataGenerator samples from the summary computed by DataDescriber and outputs synthetic data. ModelInspector shows an intuitive description of the data summary that was computed by DataDescriber, allowing the data owner to evaluate the accuracy of the summarization process and adjust any parameters, if desired. DPComp is a web-based tool designed to help both practitioners and researchers assess the accuracy of state-of-the-art differentially private algorithms.